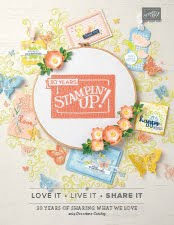 cardstock, embellishments, instructions, a clear D sized block (if it is your first Paper Pumpkin), envelopes if this is a card kit, and adhesive. All you need to bring are a pair of scissors, maybe a group of friends and their Paper Pumpkins, and some uninterruptible time for you to create a fabulous project. There are usually around 8 things to make that can range from cards to gift bags and such. 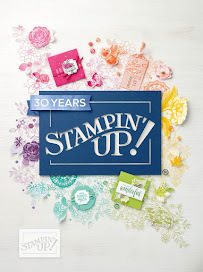 open the light blue tissue paper, be careful of the stamps and ink spots, to reveal a cute project. It comes all plastic wrapped together. You open it up and lay out all the contents. The instructions are inside and on back the the cover photo insert. 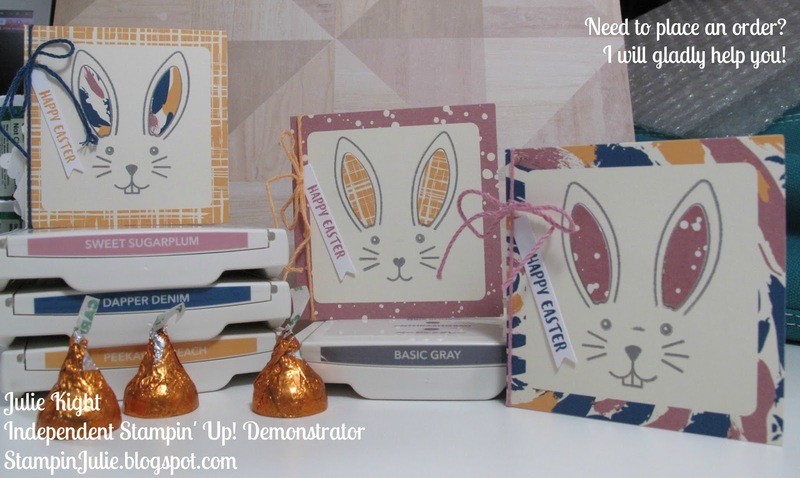 As stated before, with this month's Paper Pumpkin, you get to make two items and I started with the mini cards. I followed the instructions exactly as they had stated them in the instructional insert. 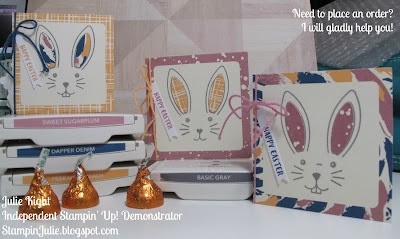 I first started with stamping the bunny face in Basic Gray. Then I stamped the two ears above the face at an angle. Next, you take the smaller ear stickers and chose any of the colors you want to match your card and place them inside of the stamped ears. Now, you need to stamp one of the little white banners with one of the smaller sentiments. 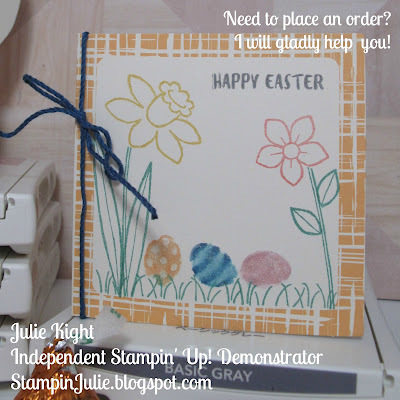 Then, you stamp the inside of the card with one of the other sentiments all using Basic Gray. center fold and tie a bow and viola! You now have a cute little mini card to give a friend or family member. place one of the little pom poms in a coordinating color on top of the glue dot. And you have a cute little Bunny candy pouch. stamp and then stamped the card. Next, I stamped the front and inside sentiment in Basic Gray. 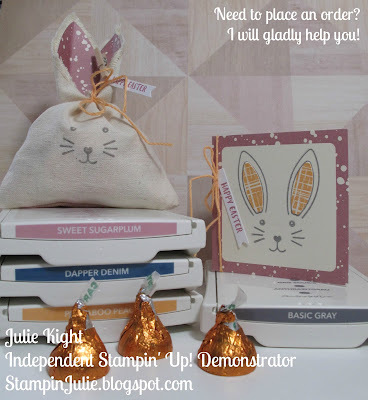 Finally, I used my Clear Wink of Stella on the Easter Eggs and took a piece of Dapper Denim twine and tied it around the card. 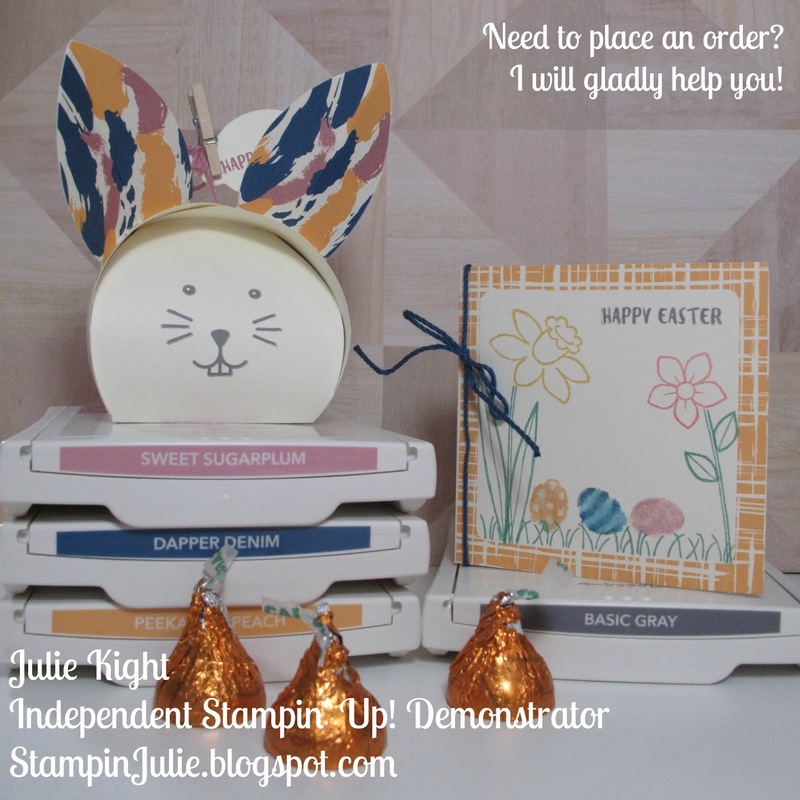 For the cute bunny box, I used the Curvy Keepsake Box Thinlits Dies and Very Vanilla cardstock. I stamped the bunny face onto one of the sides of the box that tucks underneath Then I got out a scrap of Very Vanilla and placed two of the larger sticker ears on it and then cut out around them leaving a piece about 1/4" at the bottom. I cut this flap up the center to the sticker part and then folded the ear in half. Before I assembled the box I glued the ears on in a position I liked. After the glued dried I put the box together. 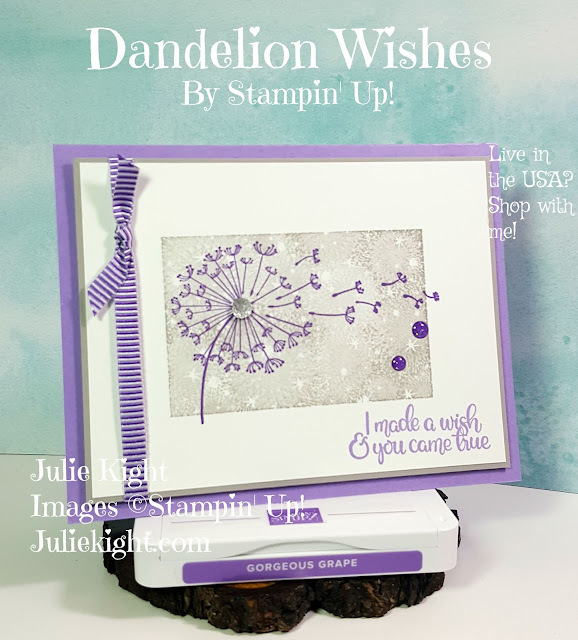 I stamped one of the sentiments onto another scrap piece of Very Vanilla and used the oval tag from the box dies and die cut it out. I then tied some of the twine around the box handle and used a clothespin to attach the stamped tag. I finally used some more glue and glued one of the pom poms onto the back of the box for a cute bunny tail! Paper Pumpkin. Our CEO Sara Douglass designed a spectacular box that is both bold and sassy just like her! And in each and every April Paper Pumpkin box will be a special surprise gift for everyone. Plus, if you hurry and and purchase a 3-month prepaid subscription by tomorrow, March 31st, you will still get the Sale-a-Bration price of $55! Plus, you will get to choose 1 Free Sale-a-Bration item of your choice. Use item #137859 on your online order. Go here and click on Shop Now to place that order! 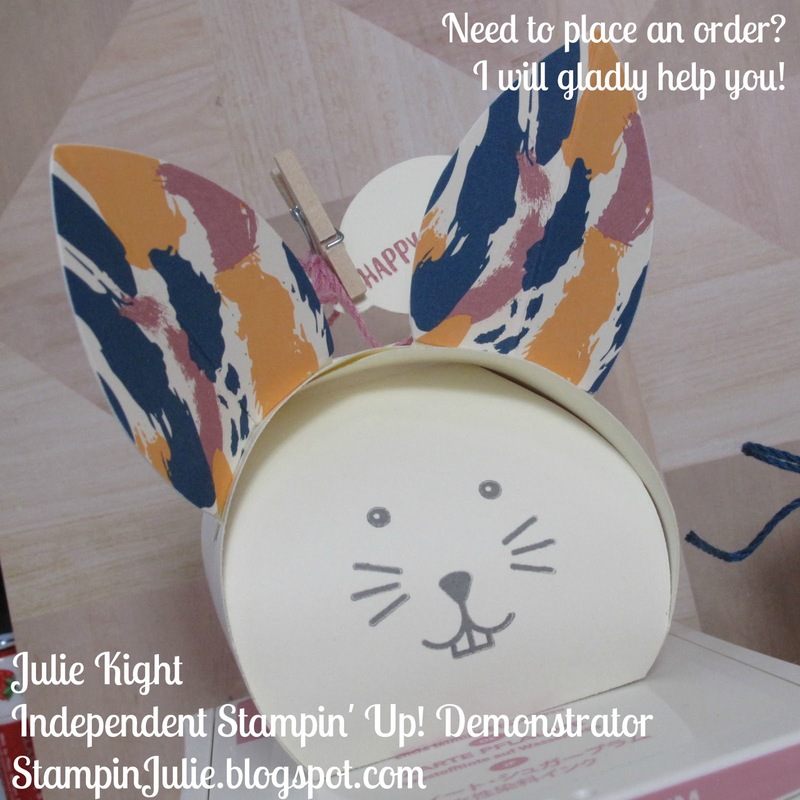 Here are some reasons why Paper Pumpkin is a great choice for anyone! So, if you like the idea of a little box of craftiness showing up on your doorstep each month, or know someone who would like this too, then Paper Pumpkin would be great idea. And remember, Paper Pumpkin would make great birthday, anniversary, Mother's Day, or any holiday presents!